Bishop Tissier de Mallerais: "The irregularity is that of Rome, a Modernist Rome." 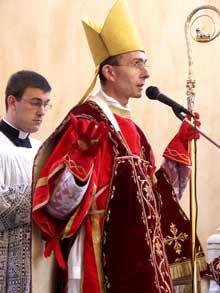 Bishop Bernard Tissier de Mallerais is one of the four bishops of the Society of Saint Pius X (FSSPX / SSPX) consecrated by Abp. M. Lefebvre in 1988. He will ordain 8 new priests (6 for the SSPX and 2 for the Traditional Benedictines) and 13 deacons (all SSPX) on Friday, June 15, in the SSPX seminary in Winona, then preside over 3 confirmation ceremonies from June 17 to 24. Rivarol, a French periodical mostly dealing with political matters, published the following interview with him today. The interview itself was conducted on the first of June. Between the sentiments expressed here by Bishop Tissier de Mallerais and those expressed by Bishop Fellay in his recent interviews and sermons, there is a wide gulf hard to ignore. RIVAROL: The imminent "reintegration" of the Society of Saint Pius X (SSPX) within the "official Church" is mentioned widely. What is it exactly? Bp. TISSIER de MALLERAIS : “Reintegration”: the word is false. The Society of Saint Pius X (SSPX) has never left the Church. It is in the heart of the Church. There where the authentic preaching of the faith is, there is the Church. This project of "officialization" of the SSPX leaves me indifferent. We have no need of it, and the Church has no need of it. We are already on the pinnacle, as a sign of contradiction, that attracts those noble souls, that attract lots of young priests, despite our pariah status. One would wish to place our lamp under the bushel for our integration in the Conciliar world. This status that is proposed to us, of a personal prelature, analogous to that of Opus Dei, is a status for a state of peace. But we are currently in a state of war in the Church. It would be a contradiction to wish to "regularize the war". R. : But some in the Society of Saint Pius X think that it would be in fact a good thing. Are you not bothered by this "irregular" situation? Bp. T.: The irregularity is not ours. It is that of Rome. A Modernist Rome. A Liberal Rome that has renounced Christ the King. A Rome that had been condemned in advance by all Popes up until the eve of the [Second Vatican] Council. On the other hand, the experience of the priestly societies that have joined current Rome is that all, the ones after the others, included Campos and the Good Shepherd, have been constrained to accept the Vatican II Council. And we know what has become of Bp. Rifan, of Campos, who now has no objection to celebrating the new mass and who has forbidden his priests from criticizing the Council! R: What do you say to those who believe that Rome has changed with Benedict XVI? R: But some think that Benedict XVI, coming from Catholic Bavaria, and who has displayed, they seem to know, "deep piety since his youth," inspires confidence. How do you respond to them? Bp. T.: It is true that the Pope is very pleasant. He is a kind, polite, thoughtful man, a man who is discreet, but possesses natural authority, of man of decisiveness, who has solved many problems in the Church with his personal energy. For instance, problems of morality in this or that priestly institute. But he is imbued with the council. When he says that the resolution of the SSPX problem is one of the main tasks of his pontificate, he does not see where the real problem is. He misplaces it. He sees it in our so-called schism. Well, the problem is not that of the SSPX, it is the problem of Rome, of the neo-Modernist Rome, that is not the eternal Rome anymore, that is not anymore the Mistress of wisdom and truth, but that has become a source of error since the Vatican II council, and that remains so today. Therefore, the solution of the crisis can only come from Rome. After Benedict XVI. R: So how do you solve this disagreement with Benedict XVI, which is considered scandalous by many of those in the SSPX? Bishop T.: It is true that the SSPX is a "stumbling block" for those who resist the truth (cf. 1 Petr 2, 8) and this is good for the Church. If we were "reinstated", we would, by that very fact, stop being a thorn in the side of the conciliar church, a living reproach to the loss of faith in Jesus Christ, His divinity, in His kingdom. R.: But, Excellency, you wrote with your two colleagues a letter to H.E. Bp. Fellay to refuse a purely practical agreement with Benedict XVI. What are the reasons for this refusal? Bp. T.: The publication of our letter is due to an indiscretion for which we are not responsible. We refuse a purely practical agreement because the doctrinal question is fundamental. Faith comes before legality. We cannot accept a legalization without the problem of the faith being solved. To submit ourselves now unconditionally to the higher authority imbibed with Modernism would be to expose ourselves to have to disobey. And what is the good in that? Abp. Lefebvre said since 1984: "one does not place oneself under an authority when that authority has all the powers to demolish us." And I believe that that is wise. I would like us to produce a text that, renouncing to diplomatic subterfuges, clearly affirms our faith and, consequently, our rejection of the conciliar errors. This proclamation would have the advantage, first, of saying the truth openly to Pope Benedict XVI, who is the first to have the right to the truth, and second to restore the unity of the Catholics of Tradition arround a combative and unequivocal profession of faith. R.: Some believe that the statute of personal prelature proposed to you will provide sufficient guarantee to you concerning all danger of abandoning the combat for the faith. Bp. T.: That is incorrect. According to the project of prelature, we would not be free to create new priories without the permission of the local bishops and, additionally, all our recent foundations would have to be confirmed by these same bishops. It would thus mean subjugating us quite unnecessarily to an overall Modernist episcopate. R.: Could you detail for us this problem of faith that you wish to see resolved in the first place? Bp. T.: Certainly. It is, as Abp. Lefebvre used to say, the attempt by the Vatican II Council of conciliating the doctrine of the faith with the liberal errors. It was Benedict XVI himself who said it, in his interview with Vittorio Messori in November 1984, by declaring: "the problem of the 1960s (and therefore of the Council) was the acquisition of the most matured values of two centuries of Liberal culture. They are the values that, while originating outside the Church, may find their place, once purified and corrected, in her vision of the world. And it is what was done." That is the work of the council: an impossible conciliation. "What conciliation can there be between light and darkness? ", the Apostle says, "what agreement between Christ and Belial?" (2 Cor 6, 15). The emblematic manifestation of this conciliation is the Declaration on Religious Freedom. In the place of the truth of Christ and of his social kingdom over the nations, the Council places the human person, his conscience and his liberty. It is the famous "change of paradigm" admitted by Cardinal Colombo in the 1980s. The worship of the man who becomes God in the place of the worship of the God who became man (cf. Paul VI, address on theclosing of the Council, December 7, 1965). It is a new religion that is not the Catholic religion. We do not want any compromise with this religion, any risk of corruption, not even any appearance of conciliation, and it is this appearance that our so-called "regularization" would give us. May the Immaculate Heart of Mary, immaculate in her faith, guard us in the Catholic faith. God bless Bishop Tissier de Mallerais! There can be no compromise with a Rome still controlled by the Modernists, who only seek the wanton destruction of Tradition. Bishop Tissier de Mallerais' interview is excellent. His claims cannot be swept under the rug because of controversial views he hold, and he was very close to Archbishop Lefebvre. His first answer deals with those who equate irregularity with "schism." The second keeps it real, noting the disturbing modern infatuations amongst many in Rome. He also makes it very clear that BXVI, whilst being a nice man, is not a "trad," nor is he the great restorer traditional pope. Basically, this interview is the perfect response to those opposed to the "hardline." He addresses the canonical situation, the state of the Church, Benedict XVI, and the errors of the Council. What he did in one interview so eruditely accomplished what I have tried to tell people with posts, emails, and conversations. This interview is excellent. His statement that the Church has no need for the "officialization" of the Society is very troubling. Not even as a matter of justice, your Excellency? How will the SSPX's argument that they are in the "heart of the Church" be vindicated if not by Roman "officialization" at the hand of a friendly Pope? Are the gifts of the SSPX (the "light not hidden under a bushel") not gifts to share for the restoration of the Roman Church? If the SSPX is not interested in having its arguments vindicated or being restored to official status within the Church, then what are they working for exactly? There where the authentic preaching of the faith is, there is the Church. Bishop Tissier makes up his theological maxims as he goes. If someone shows me any preconciliar text of the magisterium, a Catholic theologian or a Saint, that says "There where the authentic preaching of the faith is, there is the Church" I'll donate 50$ to the SSPX. (06-14-2012, 05:34 PM)Freudentaumel Wrote: [ -> ] There where the authentic preaching of the faith is, there is the Church. The Church must possess the Faith. If any authority does not possess the Catholic Faith, how can that authority claim to possess Catholic authority, which thus demands obedience? Show me where in any day of Christian history one could hold the view that "where the faith is not, there is the Church." (06-14-2012, 05:29 PM)Ray M Facere Wrote: [ -> ] His statement that the Church has no need for the "officialization" of the Society is very troubling. Not even as a matter of justice, your Excellency? How will the SSPX's argument that they are in the "heart of the Church" be vindicated if not by Roman "officialization" at the hand of a friendly Pope? Are the gifts of the SSPX (the "light not hidden under a bushel") not gifts to share for the restoration of the Roman Church? If the SSPX is not interested in having its arguments vindicated or being restored to official status within the Church, then what are they working for exactly? For there to be a regularization, that means one was in the wrong. Were Abp. Lefebvre's actions in 1976 wrong? In 1988? I, as well as Bp. Tissier, say no. They are working for a true restoration. (06-14-2012, 04:58 PM)Crusader_Philly Wrote: [ -> ] Bishop Tissier de Mallerais' interview is excellent. His claims cannot be swept under the rug because of controversial views he hold, and he was very close to Archbishop Lefebvre. Considering that Fr. Laguerie, the Superior of the Institute of the Good Shepherd, personally called Fr. Caqueray to plead the Society to not accept the deal, the hard line position cannot be dismissed. Have times really changed? Why is the Good Shepherd Institute being suffocated at this very moment?Will such a fate happen to a regularized SSPX? One incorrect sentence does not make another incorrect sentence correct.